Botanical gardens may be one of the best places to see holiday lights this season, but zoos, parks, and even city plazas should not be dismissed. There are incredible light displays to see even in little towns across the country with big Christmas spirit, but here are a few of our big city favorites to explore during the holidays when we need a little extra LED magic in our month. Tour the garden of lights at night, and warm up in the green house conservatories all dressed up for the holidays. Kids will love the indoor Children's Garden, while parents will be dazzled by the Christmas displays that change every year. Let your children run through the garden railway, best seen during the day, to get a glimpse of miniature trains driving past Longwood Garden buildings, through tunnels, and over bridges. It's like a little trip to the Isle of Sodor, and Thomas may even make an appearance on the track. End your train-filled day and lit up night with a stop at the Open Air Theatre Fountain show that runs every 5 minutes after 3:30pm during the holidays. Experience the winter beauty that surrounds the Denver Botanical Garden through Blossoms of Light, one of two light displays in the garden this Christmas. HoloSpex glasses add even more whimsy to the evening by creating different shapes in the lights. Wander into the foothills with more than a million lights to guide you as you explore the short route that takes you to the children's play area, or the longer route that takes you past the Green Farm Barn and 1880's homestead. Thaw out in the warming hut and at the fire pit. Don't forget to grab a hot beverage and enjoy the seasonal entertainment (nights vary). Grab your family photos at the Trail of Lights Rainbow Tunnel or Starry Night Tunnel, but make sure you check out some of the new and spruced up old exhibits. The Globe, Big Tex-Mex, Candyland, and Santasaurus are just a few of the fun displays your kids will be able to chose from when voting for their favorite of the night. Write a quick letter to Santa in Armadillo Alley, watch a candy demonstration at Candyland in Zilker Village, and meet Santa at the North Pole. No holiday outing is complete without a tasty treat or two. Crepes, ice cream, Tex-Mex, BBQ, kettle corn, and funnel cake are on sale just waiting for you to devour them in an effort to keep your blood sugar up so you can finish off your night of exploration, drive home, and get the kids in bed before you pass out from all of the holiday fun in the park. Just 45 minutes south of Seattle is a wonderful little zoo doing big things with lights during Zoo Lights each season. They draw a crowd, so make sure you get your tickets early. If you want to make an afternoon/evening of it, come early to grab day + night tickets so you can see the animals while they are awake before you grab a bite to eat and hop back into the park to view the lights and maybe even ride a real camel. The giant purple octopus on top of the aquarium is one of our family favorites. Toss your skates over your shoulder and head into New York City for a holiday treat for the whole family. 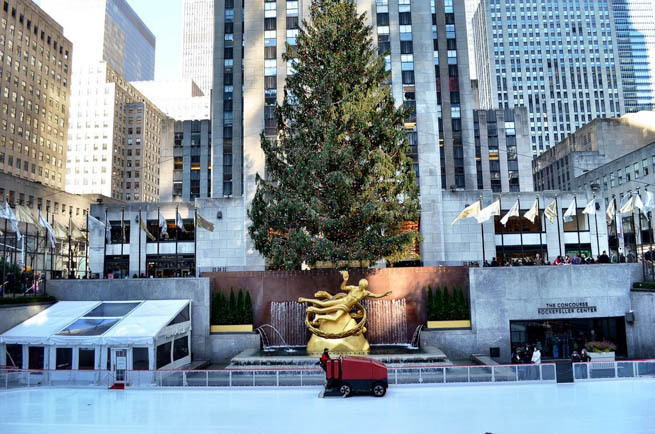 It may be cliche to say, but nothing screams Christmas like Rockefeller Center with the big tree, lights strung up around the square, and the ice rink packed with winter enthusiasts. Bundle up the kids so you can brave whatever elements Mother Nature sends your way, wave to the anchors of the TODAY Show in the morning, do a little shopping around town, and grab a coffee and macaron at the bakery nearby. It may be crowded. It may be loud. But you will give your kids a few bragging rights when they show off to their friends that they hung out in NYC, saw the tree all lit up at night in Rockefeller Center, and got that massive bruise on their leg after falling on the ice at the rink. Bonus: catch a matinee of the Radio City Christmas Spectacular to see the Rockettes really kick the holidays up a notch. Where is YOUR favorite light display in the US? Keryn is an East Coast native living life as a freelance writer in Seattle surrounded by her two little boys and one incredible husband. When not dragging the men in her life across the globe you can find Keryn writing on her blog Walking On Travels, a site that gives hope to today's modern parent that doesn't see kids as a roadblock to travel, but an excuse to get out the door and explore. Keryn has laughed at the naysayers by bringing her boys to far off lands like China, Hong Kong, Japan, Hawaii, back and forth across the USA, Mexico, Canada, and even across Europe. Keryn loves to encourage families to take that first step out the door, the hardest step of all. Follow Keryn on Twitter, Facebook, Instagram, Pinterest, and Google Plus.